The modela is a nice little milling machine that cranks out most of the circuits you will need for HTMAA. 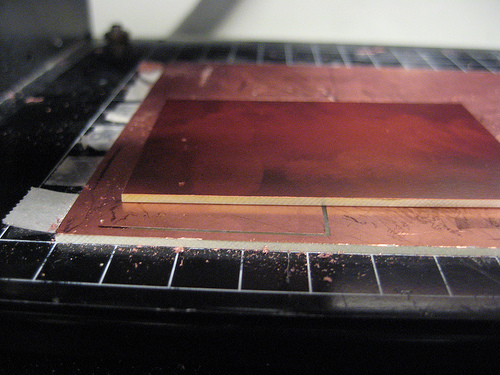 To be able to mill on it, you need to have FR1 which is a paper based copper plate. You cannot mill the fiberglass copper plates on the modela as it will break your bit and the dust it will create is irritant. The FR1 is more tan than the fiberglass, which is more green, and the FR1 is in stock in 016 in 2x3 inch and 4x6 inch pieces. This tutorial is for using your own .pngs (e.g. exported from Eagle). If you are using a .png, the traces should be white and the background should be black. 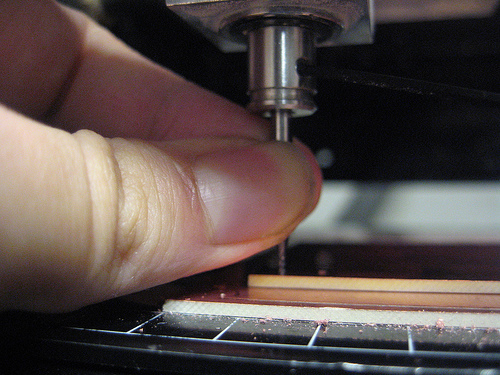 Do not make the edges of your board too wide, as it will just be more work for the modela to mill those out. If you need help designing the board, check out the PCB design page. First make sure you have a sacrificial board underneath the board that you are milling. 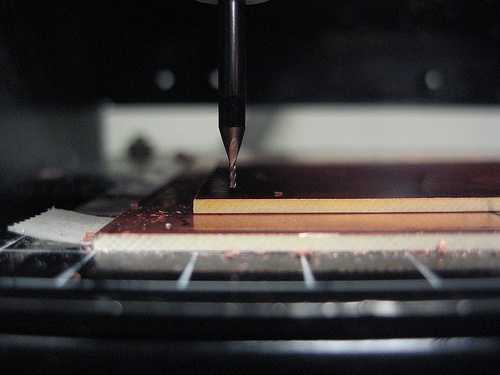 When you drill out the PCB you are making, you might go further than the actual thickness of the board. Attach the sacrificial board and the board you are milling out to the modela with double sided tape. Make sure the tape is not overlapping in any way as to not make the base for your board uneven. First, you need to use png_path to convert the png to a generic path file. This is the command that generates the contours which will form the toolpath. The example below uses 0.4 mm as the tool diameter; this corresponds to a 1/64" endmill. It creates four contours; you may want to use more (clears more of the board) or less (goes faster). Next, you need to generate the machine-specific rml file that will be sent to the Modela. The speed should generally be 4 mm/s for milling out traces with a 1/64" endmill and the depth should be -0.1 mm. If your endmill is new, you might want to reduce the speed even further (e.g. 2 or 3 mm/s) as they tend to be more brittle for the first few boards. The (x, y) origin (in mm), here (25, 25), indicates where, relative to the lower-left corner of the grid on the bed of the Modela, the origin of your board will be. To mill out the traces of a circuit board you will generally want to use a 1/64th endmill, but if you have a particularly rough circuit you might be able to get away with 1/32nd (if so, you'll need to adjust the commands in the previous section for a 1/32" endmill). Turn the Modela off and then on again to make it forget its previous z-zero setting. You'll probably need to press the view button to take it out of view mode. Then, slide the bit into the modela. When you put the bit into the modela, you don't have to tighten the set screws all that much. Snug is fine. You'll need to move the endmill over your board so you can lower it to the copper. Use the rml_move tool, sending it the x and y you used as the origin when generating your rml file above. Then lower the bit as close as you can get to your copper plate but without touching it by keeping the down button pressed. If you only press the button once, the head will move the bit down exactly 7 mills. Once you have the bit as close to the copper, loosen the set screws again and push the bit all the way onto the copper. You should hear a small tick. Hold the endmill against the board and tighten the screws again. Don't overtighten. You have now set the z origin. It will take a while to cut. If something seems wrong, you can press the view button to pause the job. Once it's done, you can press view to get at the board, and then vacuum up the dust with the dust buster. You'll need to re-zero the Modela for the 1/32" bit. Follow the procedure above, remembering to turn the Modela off and on again to forget the previous zero setting. First, pause the modela immediately: hit the View button on the machine to send the head back to its resting position. Hold down the Up and Down buttons simultaneously until the view light is blinking. This indicates that the modela still has an unfinished job in queue; if you try to shut off the modela now and turn it back on, it will resume the job from where it left off. where xxxx is the process number. If you are successful in killing the job (which might take a second), the View light on the modela should stop blinking, thereby indicating that the machine is once again ready to receive a job. If you cannot kill the cat process, just restart the computer. How do I secure my piece? for extra heavy pieces, such as wax, I found it helpful to tape both the modela board and the bottom of the wax. 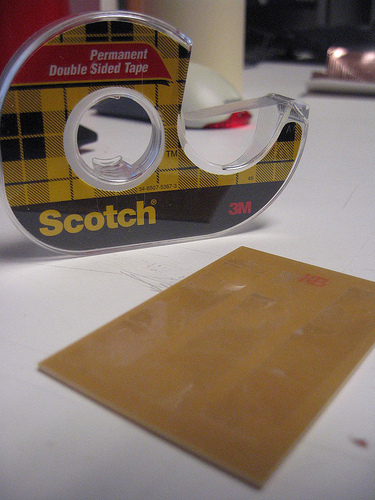 Because tape-to-tape bond is obviously stronger, you can really press the tape into the surfaces and not worry as much about fingerprints. when cutting wax or other thick material, make sure that you aren't asking the modela to cut deeper than the bit head can go, otherwise your bit will get so deeply embedded that the head will attempt to move your whole piece along with the bit. Your bit is only a certain length, and depending on how you secured your bit, the modela might not be able to cut deeper than 1/2". to save time trying to pry off your now well-secured piece, leaving a piece of the tape extending out beyond your piece will enable you to use that extended tape end as a hand-hold to pull the piece up after the job. The modela is not responding!? shim for the cover interlock switch: normally the modela has a clear safety cover over the entire cutting bed, and the modela won't run without the cover in place. For accessibility the FabLab modelas all don't have a cover, we trick the modela into thinking that it is there by wedging a shim into the switch that the modela uses to detect whether or not the safety cover is in place. Sometimes this comes loose and the modela will refuse to do what it's told until the shim is properly in place. invalid file name: make sure your file name obeys unix filename conventions and constraints.